The ACC tournament kicked off on Tuesday with three games on the schedule: Miami vs. Wake Forest, Notre Dame vs. Georgia Tech and Pittsburgh vs. Boston College. Below, we'll break down Tuesday's matchups and take a look at Wednesday's contests. For an updated bracket, be sure to check out NCAA.com. Trey McGowens and Xavier Johnson sent Pittsburgh to the second round of the ACC tournament. The pair were excellent for the Panthers (14-18) in their 80-70 win over Boston College on Tuesday. McGowens led all scorers with 26 points, while Johnson chipped in 23. That spoiled a solid performance from Boston College's Nik Popovich (21 points, nine rebounds, two blocks). The Eagles (14-17) were done in by their ice-cold shooting from the perimeter, as they finished just 6-of-25 from three (24 percent). Pittsburgh's chances of playing postseason basketball are still contingent on them winning the ACC tournament and earning an automatic bid to the NCAA tourney. That's a monumental long shot, but the Panthers took the first step on Tuesday night nonetheless. John Mooney and Notre Dame are still alive. The Fighting Irish (14-18) advanced to the second round of the ACC tournament on Tuesday, knocking off the Yellow Jackets, 78-71, behind Mooney's 20 points and 10 rebounds. Dane Goodwin (15 points, five rebounds) and Nate Laszewski (14 points) also played key roles for Notre Dame. That trio spoiled an excellent performance from Moses Wright, who had a season-high 25 points to go along with seven rebounds, three assists and two steals. Notre Dame won this game on the boards (13 offensive rebounds) and with clinical three-point shooting, hitting on 8-of-14 threes (57.1 percent). Georgia Tech's inability to get to the line (2-of-7 from the charity stripe) didn't help their cause. It's the end of the road for the Yellow Jackets (14-18), while Notre Dame still has an outside shot at March Madness if they somehow pull off a wild series of upsets and win the ACC tournament. 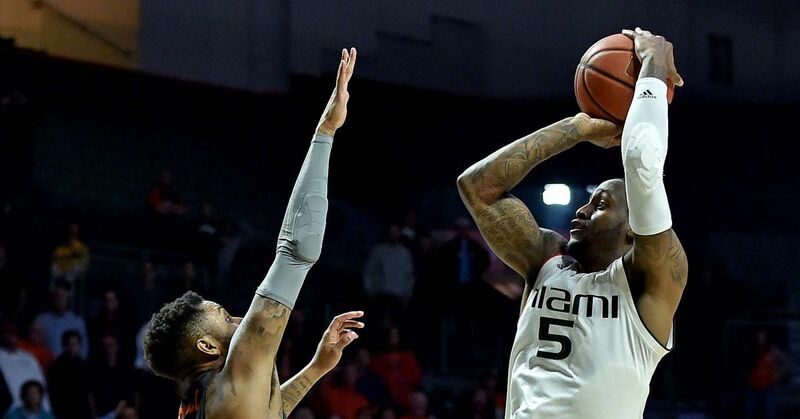 The Miami Hurricanes (14-17) kept their incredibly slim NCAA tournament hopes alive Tuesday, defeating Wake Forest 79-71 in the first round of the ACC tournament. Dejan Vasiljevic (21 points, six rebounds) and Anthony Lawrence II (20 points, 10 rebounds and three steals) were excellent for the Hurricanes, while Chris Lykes chipped in 13 points, five boards and four assists. Freshman Jaylen Hoard (16 points, seven boards) and Brandon Childress (16 points, five rebounds, five assists) led the way for the Demon Deacons (11-20). Wake Forest's turnover issues hurt them in this contest, as Miami scored 19 points off of Wake's 15 giveaways. Miami also held the advantage at the foul line, finishing 18-of-25 from the charity stripe compared to 10-of-16 for Wake. Miami opened up a 12-point advantage halfway through the second half, though the Demon Deacons were able to trim the deficit to four with a minute remaining. That was as close as they would get, however. For the Demon Deacons, Tuesday's loss ends their season. Miami is still alive, though, and could even guarantee themselves a berth in the NCAA tournament with a triumph at the ACC event. That's incredibly unlikely, given the talented teams they'd have to beat along the way, but it's nonetheless still a possibility.